Today’s (February 4) public consultation on the LRT and MRT fare hike organized by the Light Rail Transit Authority (LRTA) and the Department of Transportation and Communications (DOTC) confirmed two important issues. First, that the fare hike is indeed meant to pass on a bigger share of the debt burden to LRT and MRT commuters. The presentations of the technical staff of the two government agencies confirmed, in so many words, what we have been saying all along. Current fares are enough to cover the core expenses of operation and maintenance. But the onerous terms contained in the contracts created huge and even unnecessary debts for government. Download the Powerpoint presentations of the LRTA here and the DOTC here. 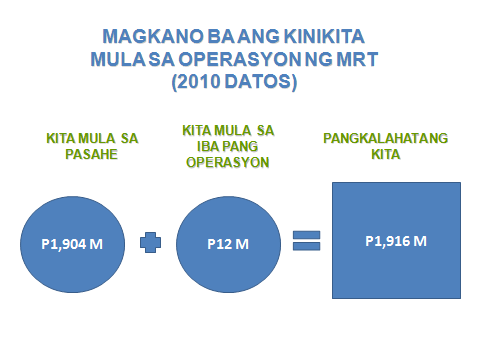 Consider, for instance, the slides below which I lifted from the Powerpoint presentation of the DOTC on MRT. The first slide shows that the total income of the MRT in 2010 was P1.916 billion, of which P1.904 billion were generated from passenger fares. However, as shown in the next slide, MRT expenses reached P8.52 billion during the same year which the DOTC said resulted in a government subsidy of P6.6 billion to bridge the shortfall in revenues (that was only P1.92 billion). The next question is what makes up the P8.52 billion in expenses? The third slide below breaks down the P8.52 billion (the figures in the slide add up to P8.52 billion) and shows that operating costs comprise only 7.6 percent of the total and maintenance costs comprise only 13.9 percent. A huge 61.1 percent represents the Equity Rental Payment, which refers to DOTC payments for the 15 percent return on investment (ROI) that government guaranteed private investors in their Build Lease Transfer (BLT) agreement. Another 13.6 percent represents debt payments that government also guaranteed in the BLT. 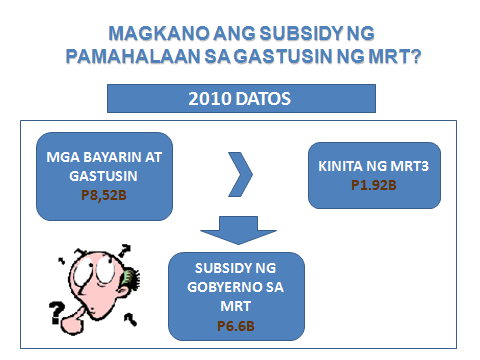 The LRTA presentation on LRT 1 and 2 tells the same story about the so-called losses and subsidies that government wants to reduce by making commuters pay more. 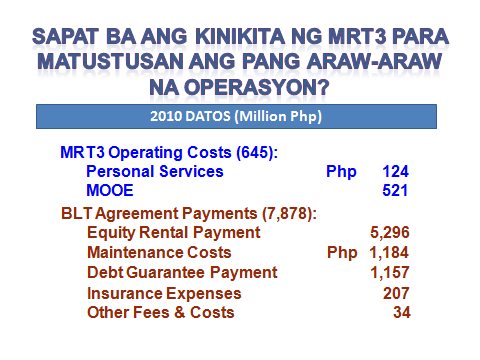 The slide below shows that the consolidated revenues of LRT 1 and 2 in 2010 was P3.089 billion but spent P2.928 billion for operation expenses. 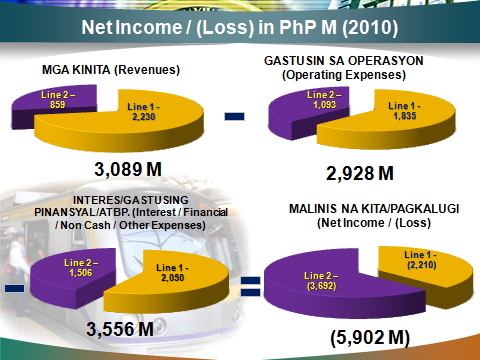 The LRTA also spent P3.556 billion for interest payments and others resulting in a net loss of P5.902 billion. 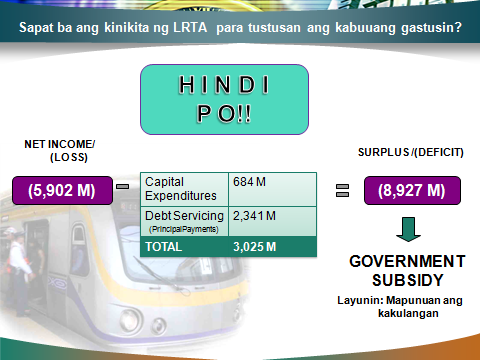 Add to these expenses the amortization of principal worth P2.341 billion and capital expenditures of P648 million, as shown in the slide below, further pushing the LRTA deficit in 2010 to P8.927 billion, which government claims is the cost of subsidy. In other words, of the P8.927 billion in so-called subsidy, P5.269 billion or more than 59 percent represents interest and principal payments for loans. If you consider that almost 8 out of 10 LRT and MRT commuters are ordinary workers and employees and students, passing on an increasing portion of these debts, which include onerous loans, through a fare hike is a major, major injustice. Secondly, LRTA administrator Rafael Rodriguez also confirmed that the public consultation is optional and therefore has no real bearing on the decision of Malacañang to increase the fare in LRT and MRT. This means that despite the opposition of those being consulted, students in this particular case, the LRTA and DOTC, as ordered by President Aquino, can still proceed with the fare hike anyway. The consultation ended with the expected “We will study your concerns”, which was the gist of the closing statement made by DOTC Undersecretary for Rail Transport Glicerio Sicat. He also said that they will consider the option of lowering the increase and giving fare discounts because of the concerns raised by the students. This, however, dismissed altogether the issues of onerous debts, mass transport as public service, privatization as the driving motive behind the fare hike, and other major policy issues that were raised during the open forum. Therefore, the commuters have no other option now but to continue and further intensify the protests until the Porsche-driving President backs down on his decision to raise the fares.